-Save money! One time investment will last years. -Get rid of mice, rats, and squirrels humanely without traps or poisons. -Create a protective barrier in your home keeping them away for good. -Eliminate the risk of disease transmitted by rat & mouse droppings and urine. After years of selling various ultrasonic mice/rat repelling devices, our company has settled on, and recommends the Attack Wave Pest Repeller. The Attack Wave Pestrepeller is guaranteed to get rid of mice, rats, squirrels, cockroaches, fleas, crickets, ants and most of the other common pests. Laboratory research has shown ultrasonic sound waves attack the auditory and nervous systems of most common pests causing them pain and discomfort. With 110 decibels of sound pressure, pests will give up their source of food, water and shelter and move on. These high-intensity sound waves are out of the hearing range or human beings and most household pets such as dogs, cats, fish, birds, and farm animals. The Attack Wave will not interfere with televisions, radios, electronic burglar alarms, fire or smoke detectors, pacemakers, hearing aids or other electronic equipment. The Attack Wave will not harm plants either. We confidently recommend this device to our customers and they are usually very pleased with the results. Many of our customers come back for additional Attack Wave repellers for their friends and relatives who are also fighting with annoying pests! If you are not 100% satisfied, and the Attack Wave does not get rid of your problem, just email or call us for a Return Authorization Number, and we'll gladly refund your money! The Rat/Mouse Repeller with a continually changing frequency! Our device has an auto-changing and auto sweeping high intensity frequency range above 30,000Hz to 65,000Hz. The unique circuit design of our repeller strikes the auditory and nervous systems of the pests strongly. This specially designed function is effective in preventing Rats, Mice & Other pests from producing immunity to a pre-set single sweep rate. This Repeller is an improved design over conventional mouse & rat repellers. No adjustment for the periodical sweeping rate is necessary as in the conventional models. 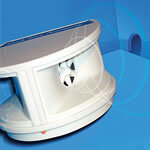 Rodents & other pests will never get used to the ultrasonic sound waves emitted from this repeller. The Attack Wave effectively protects an area up to 4,000 - 5,000 unobstructed square feet. In a home with rooms, hallways, and furniture the effective range is closer to 2000 square feet. After plugging the repeller in you will notice a small red L.E.D indicates the repeller is operating properly. The Attack Wave's unique test button on the back panel when depressed causes the unit to shift its output down into the audible frequency range for a reassuring check of its ultrasonic output. The shrill, shock, unregulated siren-like sound simulates the sound that pests hear continually. "I admit I was skeptical before purchasing the Attack product from you guys. I was catching 2 or 3 mice a night in my kitchen with the wooden traps. I plugged this unit into the outlet above the counter and within days I had stopped catching mice. I would no longer come out in the middle of the night to flip the light on and see one running on my counter along the wall. Cool product, works great. Thanks." Just plug into an electrical outlet, the Attack Wave can be used indoors at any time. You will notice the effect of the Attack Wave within a few days. There will be an absence of rodent activity. Perhaps you will notice an increase in insects' activity during this period of time as the ultrasonic sound waves drive these pests from hiding. In a short while they will be gone as well. While the pests are being driven away, they are undoubtedly leaving their eggs an larvae behind. Incubation will continue and they will hatch as usual. However, The Attack Wave will send the ultrasonic output continuously to attack their auditory and nervous systems to drive the new generation away. In 4 to 6 weeks the infestation should be over and you will be free of pests. Leave The Attack Wave plugged in for year round, day and night pest control. It costs only about a 1/2 cent a day to operate. No more dangerous chemicals to buy, no more messy traps to clean when you set up the Attack Wave. Exterminators can cost hundreds of dollars. With the attack wave you'll get an economical solution that will provide years of protection and peace of mind. Can I use the Attack Wave in my attic? Yes. The Attack Wave is a great device to place up in an attic to drive away rats, mice, squirrels and other rodents while prventing them from coming back to nest. Will my dog or cat be affected by the Attack Wave? No. The sound waves being emitted from the Attack Wave are above the hearing range of dogs and cats, they will not hear the unit at all. Are Mice and Rats Dangerous? Mice and rats are not dangerous in the sense that they will attack or bite (although there have been rare cases of rats biting a person in the night while sleeping). The biggest concern with rodents, is the fact that they carry diseases and can transmit dieseases in their droppings and urine. A common place for mice to infest is the kitchen area as this is the area where they typically have access to food and water. If mice are crawling through your cabinets and drawers they can urinate in dishes, cups, or bowls and the unrine will go unoticed as it is not visible like droppings are. Rodent urine can be very toxic and is a major health hazard. Dimensions 5in. x 4in. x 3in. What makes the Attack Wave more effective than other units? Effective Range 4,000 - 5,000 Sq. Ft.